After a fortnight of air attacks, the USA has launched ground operations in Afghanistan with over 100 army Rangers and other special forces targeting an airbase on the outskirts of the Taliban stronghold of Kandahar. 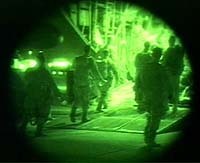 This image of US special forces troops participating in the raid into Afghanistan, taken with night vision equipment, was released by the US Department of Defense. Should the US get entangled in a land war in Afghanistan? The USA launches a new phase of its military operation. A US helicopter, which crashed overnight on a support operation in Pakistan, came down near the southwestern airbase of Dalbandin, a local official said today. A pivotal Taliban minister who holds the Tribal Affairs portfolio today met with the Pakistani Foreign Ministry and talks touched on a future broadbased government for Afghanistan, an official said. United Nations Secretary-General Kofi Annan today invited Pakistan President Pervez Musharraf to attend the UN General Assembly Session starting November 10. Will Pak economy gain from Afghan war? Home Minister L.K. Advani today warned Pakistan of ‘consequences’ if it persisted in its support of terrorist activities in Jammu and Kashmir. Speaking to newspersons here, Mr Advani said India had no plans, for the present, to strike at terrorist camps across the border but indicated that the option of ‘hot pursuit’ could be used if Pakistan continued to push infiltrators into the country. The US Senate yesterday condemned the bigotry and violence against Sikh Americans. The resolution was introduced by Senator Richard Durbin. The wife who surrenders is the one who conquers! Why are you running away? I am your good old postman! Six policemen and a department driver, on their way to help colleagues besieged by extremists, were killed in a landmine blast at Jagpura village in the extremist-dominated district late last night. It is suspected that the blast was triggered by a gang of criminals, whose chief Jayanandan Yadav was recently gunned down by the police. 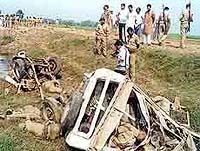 Police officers wait besides the wreckage after a vehicle hit a landmine about 40 km from the city of Patna, the state capital of Bihar, on Saturday. Fear of anthrax making it's presence felt in India, with Parliamentary Affairs Minister Pramod Mahajan personally supervising the checking of mail in the post office. The anthrax scare gripped Ludhiana and Shimla today. Alarm bells rang in the police and the Health Department today when a Focal Point resident of Ludhiana received a suspicious packet sent to him by an unidentified person from St. Louis, USA, and panic gripped the GPO in Shimla when an envelope with a foul smelling power was found while sorting the mail.